The International Institute for Genocide and Human Rights Studies (A Division of the Zoryan Institute) partnered with the Holodomor Research and Education Consortium, the Canadian Institute of Ukrainian Studies of the University of Alberta (Toronto office), the Canadian Foundation for Ukrainian Studies, the Petro Jacyk Program at CERES (Munk School of Global Affairs), and the Department of Slavic Languages and Literatures of the University of Toronto to host a symposium on the political uses of starvation and its relation to genocide. 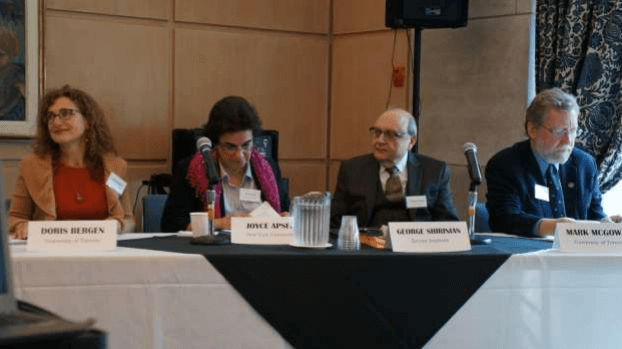 The symposium took place on October 22, 2015 at the University of Toronto. During the Irish Famine of 1845-1851, some 1 million people died. Dr. Mark McGowan from the University of Toronto explained that although it was not orchestrated by the Bristol Gov. their policies to relieve this crisis were inadequate. While substantial funds were used to establish systems like poorhouses and soup kitchens to alleviate the the suffering Irish population, these did not effectively combat the emergency. Further interventions did not occur, by the government or others with the potential to help, such as the English landowners and the Irish clergy. Mr. George Shirinian of the Zoryan Institute described how Turkish authorities had the gendarmes use circuitous death marches leading to the desert to exhaust, starve and eliminate their victims from 1915 to 1918 during the Armenian Genocide. They only occasionally provided small food rations, often in return for bribes or sexual exploitation. The Young Turk leadership use this elaborate method to draw out and enhance the suffering of the Armenians in order to exert Turkish dominance over them, for their perceived attempts to rise above their subject position. When the Ukrainian Communist Party began to side with the Coolax, who largely resisted Stalin’s collectivization plans, measures were taken to punish this group and demonstrate Soviet power. Dr. Andrea Graziosi, from the University of Naples, examined Stalin’s enforced famine, the Holodomor, 1932-1933, which killed roughly 4 million Ukrainians. Omar al-Bashir’s government in Sudan has neglected the needs of populations in the south since conflicts arose there in the 1980s, and has since undertaken measures to persecute and eliminate the Nuba people. In “peace camps,” women and children are abused, converted to Islam or starved by the northern army. Dr. Sam Totten, Professor Emeritus of the University of Arkansas, discussed what he calls, “genocide by attrition.” Bombings destroy farm land and force others into the Nuba Mountains where they have no access to food and must subsist on roots and grasses. Humanitarian aid is denied by the government, submitting this population to genocidal methods of starvation. Panel Chairs Dr. Doris Bergen, Chancellor Rose and Ray Wolfe Professor of Holocaust Studies at the University of Toronto, and Dr. Bohdan Klid, Director of Research and Publications at the Holodomor Research and Education Consortium, introduced the speakers. Discussant Joyce Apsel, Master Teacher in Humanities at New York University and instructor on Genocide and Human Rights, raised questions about broader issues relating to the case studies. Taking a comparative approach, she looked for larger themes across all contexts: how some mass atrocities have gained more public attention than others, if starvation has been considered an integral instrument of government control and genocide, issues of agency and responsibility, and the impact of these events on diasporas. 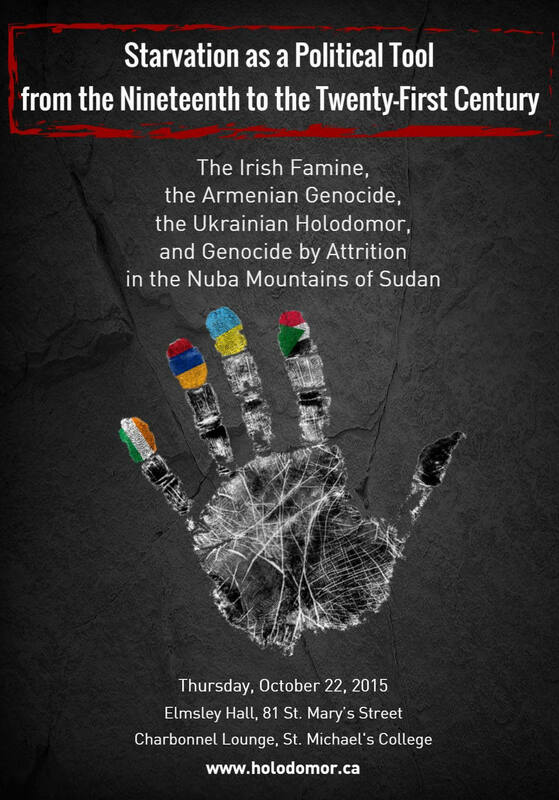 By bringing together experts on these 4 case studies and examining them in a comparative context, the deliberate use of starvation as a weapon of genocide became much clearer. The papers of this conference will be published in a future special issue of Genocide Studies International.